Hi there... It's almost the end of the month... just a few days left to enter our challenge this month...Just click on the post at the top of the blog. A big thanks to all who have entered so far. I'm so pleased I don't have to chose a winner (Random.org does that for me!) as everything is just awesome. Today I'm sharing a card I made when I was on the DT for LBBS. 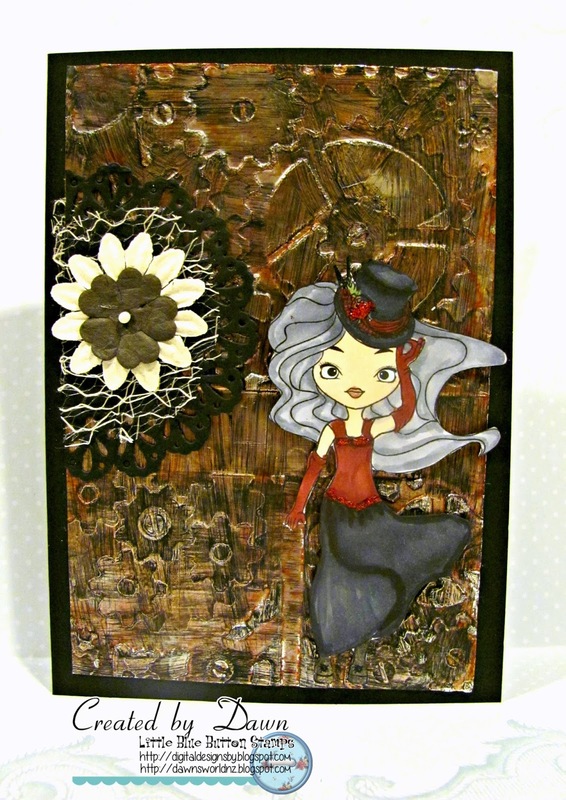 This is Steampunk Jessica The embossed background is a Spellbinders folder which has had black paint and distress stains in bronze added. I coloured Jessica with Copics and fussy cut her. The black doily is a die from MFT and finished with some mesh and a flower. Little Blue Button Stamps has some very cute images and I love this one. I would never have thought of die-cutting this house or cat in that flowery cardstock if I hadn't already had it out on the desk. The dry embossing folder was backward when I put the paper in, but I rather like the unusual indentations for this card as well as the whimsical patterns, colors, and papers. Hope you think this is fun too..
A pretty in pink gift card. Nothing pretty than a pink card and this one from Hannah is a perfect example. Hannah has used a Little Blue Button stamp "Miss Lily Coffee break" so of course she decided to make a little gift card holder for a Starbucks gift card. Welcome to another Little Blue Button Stamps day with the Die Cut Divas. I love the way this cute paper reminds me of spring and sunshine and happiness. A little, no scratch that, a LOT of dry embossing gives the backgrounds lots of depth without adding pop dots until the very top panel. I guess you could say this little gal is a favorite of mine. Hope you are enjoying your stamping time and would like to try a Little Blue Button stamping too. Here's a bit of SUNSHINE to add to your day! 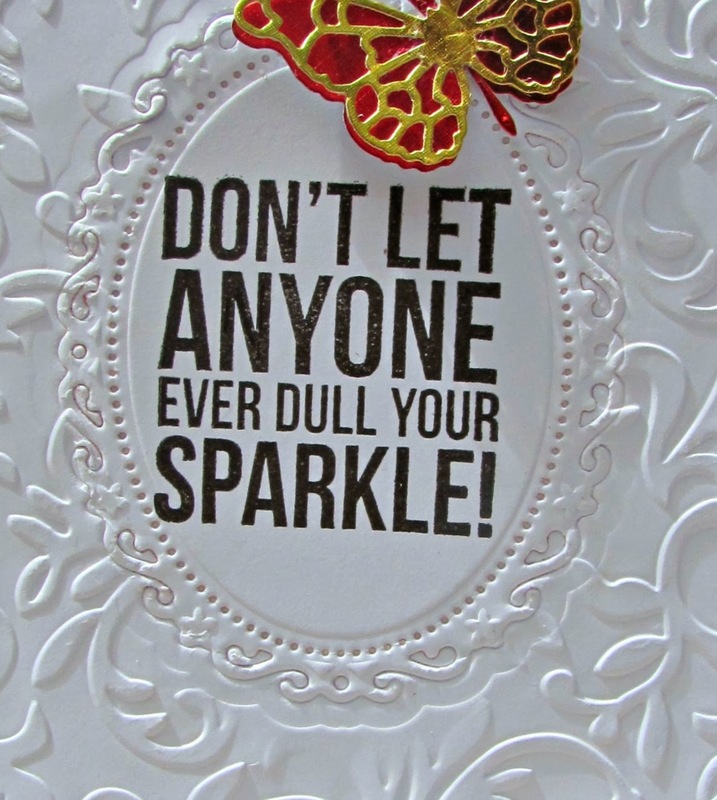 As ever, we at Die Cut Divas enjoy our stamping and playing with our stamps. It's Blue Thursday. here at my house, not because I'm feeling blue, but just because I've colored so much BLUE! I felt like coloring this Little Blue Button Stamps image in BLUES. with a little red heart in her hands. Then I found this blue sparkly background paper and oh no, BLUE birds. The birdies are die cut from the same paper background panel. Maybe you can have a BLUE stamping day too! Have you heard of Paper Casting? It is a technique that looks a bit like embossing. I found out about this a year or so ago and made a card. I have framed my panel with a Spellbinders die and mounted on an embossed background. Looking forward to seeing more of your wonderful creations. I'll be sharing some of them soon. Here is a scrapling from one of Little Blue Button Stamps, our March 2014 sponsor. I cut one 2 3/4th inch by 4 inch piece off a card I didn't like and bingo! A scrapling was born. Remember, this is not a full size card. I love little card so much I don't want to give it away. I created the brick wall on which she is sitting by coloring Copic marker T1 across and then creating bricks by using Copic marker T2 and then continue T2 across the entire bottom of the card panel. I used a white pen to put froth on her drink. I think she's adorable. "Question: What is a Scrapling? Crafters come up with all sorts of cool names for little bits of paper (such as the inchies, twinchie, and rinchie trio). Scrapling is another such term. Answer: A quarter-size greeting card is typically 5.5 x 4.25 inches (the folded size). To make it into a square card, some crafters would cut 1.25 inches off the bottom. That little scrap of paper became known as ascrapling. Instead of throwing it away (it is usually very pretty, decorative paper), it is often used to craft mini cards, tags, and labels." I see that the origin is none other than Hero Arts, here. Hi there. I'm back to share a gorgeous card set from our guest designer, Sally. Can you see the amazing embossing together with Sally's use of die cuts. And what stunning colours too. Thanks Sally for such delightful examples of your work. What a sweet image from Little Blue Button Stamps. She's lots of fun to color and add little die-cut birds. I think they are my little blue birds of happiness. Hoping you're having a glimpse of spring in your eyes. Lots of fun in blue hair and bright red clothes. Many fun cards ahead of us. Introducing our guest designer.... Sally Sherfield. My name is Sally Sherfield and I live in a small village called Milford in the South of the UK. I have been a crafter all my life and have tried most things from jewellery making to sewing and crochet but my real love is card making. I find it very relaxing after a hard day at work. I have been married to Jeremy for 32 years and we have two grown up children Tristan (29) and Francesca (26), they both still live at home but hopefully one day they will move out and then I can have a bigger craft room!!! How long have you been a cardmaker. I started card making in 2007 when a friend who had been to a card making class gave me a few lessons and I was hooked!! Do you follow sketches or just dive in. I am not really a sketch follower, I actually find it quite hard to stick to the sketch!! I prefer to dive in and play with a design or some images till they feel right. How many projects do you make a week. I usually try to make 2 or 3 projects a week, it really depends on how much spare time I have and also if its great weather I like to be outside in the garden. What is you favourite tool. My favourite go to tool is always my Big Shot, I love all the new die cuts that are available now, the market is bigger than ever and its so hard not to spend lots of money on them!! What at the moment is your most favourite thing to do on a project. At the moment I am really in to the CAS style of creating, at first I found it really hard as I just wanted to keep adding bits to my design. After a lot of practice I am finding it easier and love the look of white space on my cards. How would you describe your style. I am a real girly girl and love things pretty and feminine, Flowers and butterflies are always top of my list. I am not really keen to put images of people on my designs ( for one I find them hard to colour)! What about your style would you change (or not) and why. I really wish I was better at colouring, especially with Copics. I would really love to colour my stamped images with better shading. I also love the collage style but always find it hard to achieve. Have you been published or on a design team. I have been lucky enough to be published a few times, my blog was featured in Craft Stamper Magazine in March 2012, I had a card published in Papercrafts in Nov 2012 and I was also featured in the DoCrafts magazine in 2010. I was also on the Design Team for Tiffany Doodles in 2011 and although its not a design team I was thrilled to be asked to be a Hero Arts Hostess in spring of 2011. I craft in little room be call the office!!! Its a bit of a grand word for a tiny little room that fits a desk and our home computer. Its a shared space but I fear my craft supplies are taking over lol. I would really love a bigger space but will need to wait till one of my kids move out! Do you have a blog. Yes I do have a blog its called Designed by Sally and you can find it here. Thank you Sally for letting us get to know you. And pop back on the 14th to see some more of Sally's beautiful designs. I love the idea of adding some texture to background pattern paper and today I'm sharing a card where I did this using some images from our sponsor - Little Blue Button Stamps. This is a card I made for Little Blue Button Stamps Blog. The background is one that Olga designed and which I have recoloured in blues. I stamped the Kaisercraft sentiment and then added some blue ink all around and in places with a stencil or two. The whole panel was then embossed with a folder. I printed out the Vintage Dress form (Available here as a digital stamp or here as a rubber stamp) and used some Copics to colour. The blue wasn't quite right, so I smeared some Gesso over it to tone it down. Then I added Stickles to the wings and some Glossy Accents to the hat. The finishing touch was some twine and a vintage button. 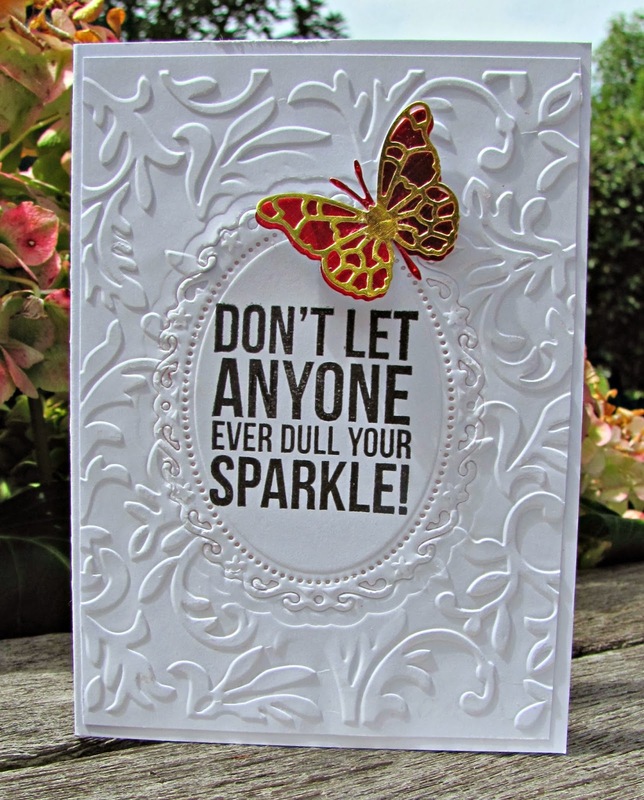 Hope this inspires you to try embossing PP. Little Blue Button Stamps is our sponsor for March. A big thanks goes out to Little Blue Button Stamps. Dawn shared Sally Loves Me with you yesterday and I thought I would share the same image, just with hair of a different color. I just couldn't help but think of this cute gal with purple hair. I thought it was a fun twist and made for a fun card. I used a stencil from My Favorite Things called Petal Pattern and some paste by Wendy Vecchi White paste. Once it dried I added some black Wink of Stella to the flower centres. I used an MFT Di-Namics Sentiment Strips die to cut my banner and stamped with a Hero Arts sentiment. The little LBBS image is called Sally with Heart. I coloured in pinks to match the matting. I started by embossing with a Die-Namics Oval Doily. Hope this has encouraged you to try out this Double Embossing Technique. I always loved to draw since I was a kid. My grandpa was an artist so I inherited this love from him. I always wanted to connect my life with this type of art so once I decided to start producing digis, and after that I came up with some rubber stamps. I’ve been in business for a year. Can anyone shop with you? In other words what happens for overseas visitors? Anyone can shop with me. Our company base is in USA but you can get digis from any country you like, as well as rubber stamps. What is one of your favourite products that you carry & why? I carry only my own designs of digital stamps and printables. My fave line is Miss Lilly and Rag Doll Sweetheart. Do you craft & how often do you get a chance to do so? Yes I love to craft. I craft not so often lately but I really love to do this. Do you have a blog or Face Book page showcasing your products? Thank you Olga for your generosity as our sponsor this month. And here are a couple of cards I've made over the past year with some LBBS digis using embossing. It's here! The moment you've all been waiting for, the question everyone has been wondering! Who has won the Grand Prize! Hi there. Dawn here for my month on Die Cut Divas. And I've got a nice and easy challenge for you this month. EMBOSS IT.... any sort of embossing... dry, heat, pastes etc. Just as long as you use your Die Cut Machine for something on you card. Of course if you dry emboss... your in! I'll be back later in the week to do a tutorial on my Double Embossing technique I used.